The End of Back Pain (As You Know It) eBook Coming Soon! In the late 1990’s I started writing a book on the causes and remedies of a type of back pain that affects upwards of 80% of people who suffer from the condition. This most common type of back pain is easy to understand and with patience and consistent effort, it can resolve. It’s taken me nearly two decades, but I’m now back at my computer committed to finally finishing the eBook. If you or anyone you know suffers from chronic low back pain, you’ll want to read and share this post. The following is an excerpt from the eBook that tells the story of my back pain history. I believe it imperative to tell you about my own back pain experiences so you can appreciate and trust that my knowledge of this subject runs deeper than what is possible to learn through books and clinical practice alone. My back has hurt countless times, sometimes very intensely. Just a few years before colleagues and I developed this program, my back often hurt chronically, for months and even years at a time. I experienced much anguish and frustration as a result. If you have a long standing back condition, be assured I have compassion for what you’re going through, and I want you to feel better as soon as possible. Life’s too short to spend years hurting and not knowing why, or worse yet, what to do about it. I was 20 years old and into my 5th week of Marine Corps Officer’s Candidate School when I first experienced low back pain. One day our training involved repeatedly bending and lifting other candidates onto our backs and then hustling across an open, pock-marked mine field. That activity heralded the beginning my back issues. This first, intense, short-lived bout of back pain lasted for only about two weeks. Before I knew it, half-a-dozen years intervened, and I experienced more back pain of a similar nature. Despite the pain, I continued to exercise. I remember lifting weights and practicing Taekwondo karate, and although I tried to discover a pattern, I couldn’t seem to attribute my back pain to any particular activity. It seemed like it would just start for no reason; the causes remained unknown to me. Because of the seemingly random nature of the problem, when it hurt badly, it felt out of control. I was at its mercy. The pain, coupled with my confusion, was maddening. At the time, I was in my middle 20’s and enjoyed being active. I needed to work too, but at least two or three times a year, sometimes for a couple of months at a time, I was totally out of commission because of my pain. It was for this reason and the fact that I was always injuring myself in Taekwondo, that I developed an interest in physical therapy. I wanted to learn how to take care of my body so I would not have to suffer from so much pain all the time. Very soon after starting physical therapy school I injured my back again. I was 27 years old. This particular incident, I hurt myself while lifting weights. I hurt it “leg pressing” more weight than was reasonable for a person of my size and strength. The pain came on slowly but intensely. After a tough two weeks, the pain diminished but did not cease again for another year and a half. Of course, as part of my physical therapy education, I was taught many methods and modalities designed to alleviate back pain; nothing I tried seemed to help, however. In fact, most of my attempts at relieving the pain made it worse. At that time, I had no understanding of the real causes or remedies of my pain. Both of my parents had had significant back pain histories; maybe it was genetic? Looking back, I remember feeling disheartened and wondering if I was doomed to live with this pain for the rest of my life. Once I graduated, the hurting slowly and unaccountably subsided. I had finally recovered from that long episode of back pain. You would think that I should have regarded that favorable circumstance positively. I did not. Because I did not yet understand what the causes or the cures of my pain were, I reasoned that it was only a matter of time before I’d injure my back again. Furthermore, working as a physical therapist and not possessing the requisite knowledge to help most back pain patients was a source of great anxiety for me, the only solace was that most every other medical professional I knew was as equally perplexed as I was. For these reasons, I was compelled to learn more about this puzzling condition. I read many books and took a lot of professional continuing education on the subject. After a particularly disappointing weekend class on another type of back pain therapy (read: bogus!) my frustration peaked and I honestly considered closing my practice and changing professions. But as providence would have it, my quest for answers to the questions of back pathology, diagnosis, and treatment was fulfilled. In January of 1996, I met my teacher, Omer Matthijs, DSc., PT, MOMT, and my orthopedic education took off under his tutelage. Omer taught me to see the spine as a system of interdependent parts which are subject to an age-related process of degeneration. As the spine ages, certain parts may wear excessively and therefore, sometimes cause pain. If one understands the process, and then acts to mitigate the stresses that might exacerbate or accelerate it, the condition can stabilize and more often than not, heal and feel better. Under Omer guidance, I started to connect the dots between the causes of particular back pain conditions and the subsequent cures. After Omer’s tutelage and following his advice, over a year passed in which I felt no back pain. It was the spring of 1997. I was 36 years old. One morning as I was getting ready for work, I bent down to pick up my cat’s food dish when I felt a little “twinge” in my back. Two hours later I could not stand up straight and was in a lot of pain. Although the pain was familiar, there was something different about this episode. This time, for the first time, I understood what was going on in my back. This time I was not afraid. Instead, I was inquisitive, wondering how the course of this incident would respond to my new informed treatment approach. May 6th, 2016. 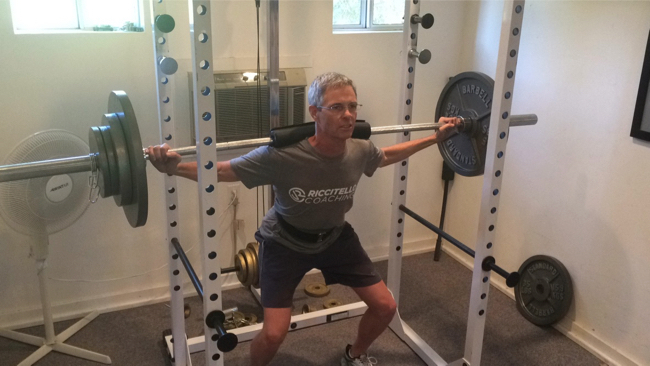 Squating 225 Pounds! I went to work that day, and aside from strictly applying the movement patterns that I will teach you, I didn’t change a thing. I even decided to go out for a short two-mile jog the day after my pain started. Astonishingly, especially to me, within four days I was completely pain-free again! Because of what I’ve learned, and how I apply this knowledge in my own life, my back pain episodes have decreased from about 3 per year to maybe one minor bout every two or more years. The way my back feels now (strong, stable, no pain), compared to what it’s felt like in the past (weak, touchy and painful), represents a triumph over a condition that disables more people in the industrial world than any other. Had it not been for this approach, you might still include me with those unfortunate many who continue to suffer. And as for the emotional anguish I experienced in the past, well, I recognize that on rare occasions I might feel a little back discomfort, but I also know its source, how to treat it well, and that it won’t last. As a result, I have no fear and therefore no emotional distress. This peace of mind and sense of control are the real jewels hidden within this approach. No one can prevent every episode of back pain. That is not what this program promises. What it does say, however, is that if one acquaints oneself with the causes and cures of back pain, and, skillfully applies the proposed treatment regimen, your experience with this condition should not get worse (as is currently the norm for chronic back pain sufferers through the age of 60). But rather, your situation can improve significantly, as measured by your pain’s intensity and duration, and the frequency of occurrences. If you don’t have an extreme pathology (see RED FLAGS), and put forth the necessary effort, it is not hyperbole to suggest that this program can teach you how to create the causes for healing whereby you will eventually develop a healthy, fit, and pain-free back again. I’ve ended my back pain, and thankfully, I can now say that my patients recover faster, more completely, and with fewer reoccurrences as well; that’s the real validating proof of the efficacy of this program. If you would like to receive periodic excerpts and updates on the progress of this eBook, please subscribe to this blog and email me at info@skillfullyaware.com. Put “End Back Pain” in the subject line. Dear Kyle, Thanks for writing in. The difficulty with offering advice sight unseen is that I don’t have a diagnosis to guide me. Pain can come from many spinal structures. The same advice wouldn’t apply to each. If you’re feeling pain up and down the spine, the cause is likely not just one structure. The causes are more likely general health, stress, or lifestyle related. Does this resonate? Hello Ali, back pain starting in the mid-thirties is super common. When we transition from a young adult (late teens, early twenties) our bodies start changing. Our collagen (connective tissue) becomes less elastic. This change sets us up for emerging neck and low back pain. Activities that previously didn’t cause injury can and do as we age because our discs lose elasticity. Mostly these changes happen slowly over years, even decades. When discs degenerate (age) slowly, the process is not painful. When it happens fast, like if you lift something heavy and tear the outer part of a disc, that WILL cause pain. 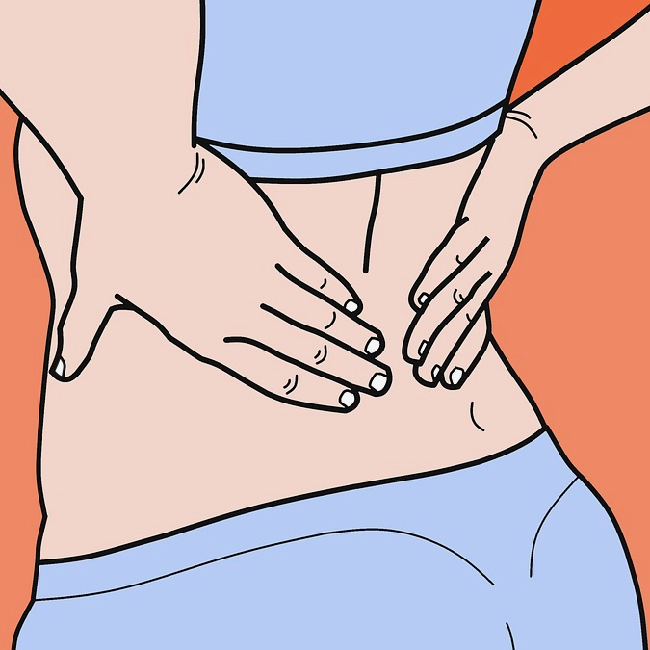 In such instances, back pain can be very painful and lower back muscles can spasm and guard to keep the area stable. Guarding muscles cause the spine to shift left or right over the pelvis too. People can also be genetically predisposed to get back pain. I am. Both my mom and dad had significant back pain. Since no one ever taught them how to care for their aging backs, they experienced lots of pain well into their 70’s and 80’s. That’s not been the case with me, however. Because I know what to do, my back is mostly good. I can’t prevent every instance of back pain, but my understanding helps me absolutely minimize the intensity and duration of symptoms. The only thing I’ll caution you about is stretching if your back hurts. Remember, discs are ligaments. They’ll heal better if you keep them stable. Exercise is okay, meaning, stay active. Just don’t do a lot of stretching. Your back pain is a typical pattern for a slowly degenerating (aging) disc. The most important thing for you is to NOT stretch in the morning. Better, move around with a sternum-up posture to protect your healing disc. After being up for a few hours you disc loses some of the water it imbibed during the night. That’s why you start to feel better. Then, the disc is not overfull, which is why you feel pain and stiffness in the morning when you wake up. I’m happy to relay more information about how you can completely end this ongoing bought of back pain. End Back Pain -Dear Mark- I just love your work. I did not make it up to Miraval this year and hope to return soon. Our back pain stories are very similar and I have learned a bit over 20 years how to manage just a few back issues a year. I would love to follow your progress. Subscribe to the Skillfully Aware Newsletter - Free gifts! 08 Project Enlightenment – Should Christians Meditate?